When you lose weight, you don’t want to gain it back. The 5 mistakes most women make. The truth about becoming thin. Why it is the program that used to work doesn’t work any longer. What really happens when you diet. How your metabolism really works. How to stay in control with food to maintain your success. 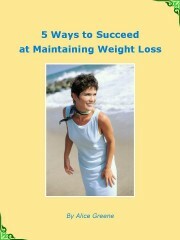 In this e-book, you will finally get the answers to long-term weight loss so you can maintain the body you worked so hard to achieve. Now you can relax and enjoy how great it feels to look and feel your best. Watch for an email shortly with your download instructions.